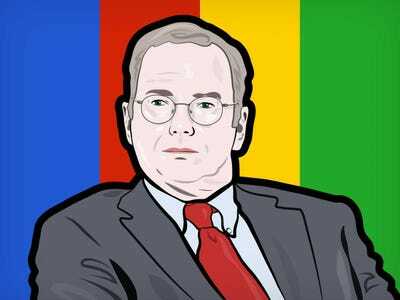 Mike Nudelman/Business InsiderGoogle Chairman Eric Schmidt. Google executives Sergey Brin and Eric Schmidt met with the NSA, according to leaked email exchanges obtained by Al Jazeera. The emails, which were obtained by Al Jazeera under the Freedom of Information Act, show that the head of the NSA, General Keith Alexander, asked Schmidt and Brin to meet to discuss potential cybersecurity threats from other countries. The meetings themselves don’t sound too crazy, but they do raise questions as to how the NSA used the information it learned from Google and other tech companies in order to spy on people, especially considering that the NSA had secretly gained access to the main communications links connecting worldwide data centres of Yahoo and Google. On June 28, 2012, Alexander sent an email inviting Schmidt to a “classified threat briefing” at a “secure location” in San Jose, California, on Aug. 8, 2012. According to the email, Alexander met with industry execs earlier in the month, but now wanted another meeting. The classified briefing cited by Alexander was part of a secretive government initiative known as the Enduring Security Framework (ESF), and his email provides some rare information about what the ESF entails, the identities of some participant tech firms and the threats they discussed. Brin attended previous meetings of the ESF group, but he couldn’t attend the Aug. 8 briefing in San Jose because of a scheduling conflict, according to the emails.